An article by Joe Pinkstone on dailymail.co.uk - Why did so many cave men have missing fingers? - reports on a new study that asks if and why Palaeolithic people amputated their fingers in religious sacrifice. Cosquer cave, located in the Calanque de Morgiou in Marseille, France, with its entrance now located 37m underwater due to the Holocene sea level rise, has examples of the hand stencils. Image: Jean Clottes. 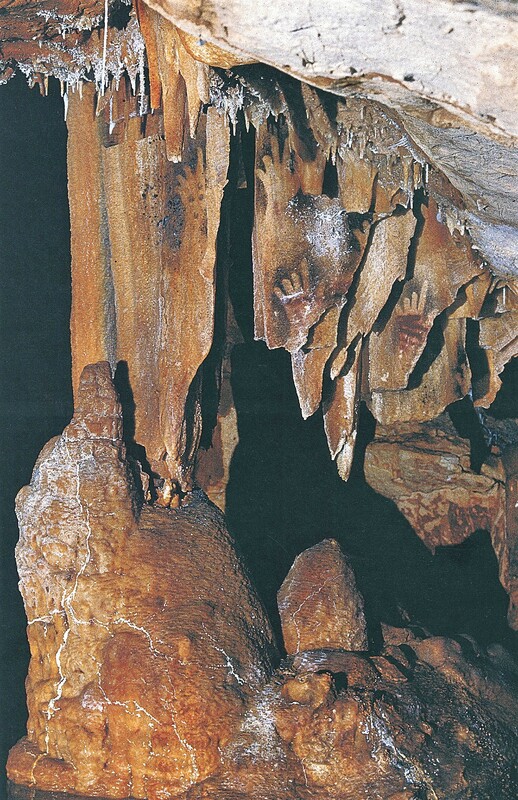 Many examples of cave art feature hand prints of people with amputated fingers. Some of the art shows examples of people with several stumps on a hand. Archaeologists do not all agree and some say it could be caused by frostbite. Prehistoric humans may have cut off their own fingers as part of a gruesome religious ritual. Cave art discovered from all over the world features hand-prints outlined with ochre and other ancient pigments. These prints are regularly missing parts of fingers and experts believe the widespread absence of the appendages is most likely as a result of religious sacrifice. Scientists say the missing fingers may also be as a result of the harsh environment in prehistoric times. Archaeologist Mark Collard of Simon Fraser University in Canada reports in New Scientist that finger amputation was a reasonably common behaviour in many regions in the recent past, for the purposes of religious sacrifice. A database including sites in Africa, Eurasia, Oceania, and the Americas revealed 121 separate societies which exhibited the same behaviour. At Grotte de Gargas in France, there are 231 hand stencils in total that belong to a group of up to 50 people. Almost half (114) of these are missing one or more digits. Conversely, some scientists have claimed there may be less painful alternatives to explain the plethora of cave art with amputated fingers, such as bending the fingers, whilst others argue that a definitive answer may never be found. Cosquer cave, located in the Calanque de Morgiou in Marseille, France, with its entrance now located 37m underwater due to the Holocene sea level rise, has examples of this. According to Dr. Jean Clottes, the hand stencils with incomplete fingers were realized by bending the fingers. Hand stencils with incomplete fingers had until very recently only been found in very few caves, mostly in the Pyrénées (Gargas, Tibiran, Fuente del Trucho). Now, we know that the phenomenon was far more widely represented than had been thought. The now-established fact that roughly at the same time such hand stencils were being made in sites hundreds of miles apart should deal a death blow to the theory of pathologic mutilations: how likely would it be that human groups living at such distances from one another should independently develop the same crippling diseases and should react in the same way by immortalizing them on the walls of the caves by means of the same techniques?